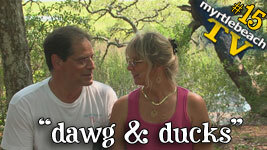 myrtle beach TV - episode 15 - "dawg & ducks"
Episode 15 opens in the beautiful setting of Vereen Gardens in Little River, where a few weeks back we covered the ceremonial ground breaking of the new community center that was 15 years we're told, from initial talks, to the eventual shovels in the ground, for the first Horry County community center. Viewers were taken back to Hard Rock Park for Sara's Beach Walk Expo, a kick-off in the parking lot of the Backstage Tour, to raise public awareness about the upcoming inaugural, 3-day charity event. There we revisited our talk with Steven Goodwin, CEO of Hard Rock Park, and talked with Matt Reed, marketing coordinator of Hard Rock Park, a little about Sara's Beach Walk, how people can get involved, and the fun that'll happen Saturday at Hard Rock Park after the charity walk concludes. We attended and shared with viewers a bittersweet, or as we called it, a "happy-sad" event: The two-year anniversary of Tim Clark's Rock-n-Roadhouse, which was also the Tim Clark band's last performance there, as Tim announced the sale of the business to the packed club of friends, fans, and loyal patrons. Viewers were also treated to interviews and performances by 80 Proof, a local band performing 80's metal, both at the Clubhouse in Myrtle Beach and at Pirate's Cove in North Myrtle Beach. We reminded viewers about upcoming events this week-end, including local bands Eason performing Friday night at McLean Park, followed by the Old Scobes at Pirates Cove in North Myrtle Beach; the duck race for the Humane Society of North Myrtle Beach Saturday at noon; also on Saturday a benefit on the Sun Cruz for 9/11 victims and firemen; and yet another Saturday event has us attending a festival at La Belle Amie vineyard featuring The Necessary Band and other musical groups and activities. Watch episode 15, "dawg & ducks", in its original HD format, by clicking here, or by clicking on the episode 15 screenshot above.